That's not a typo - this is butternut squash and nut soup. So delicious and almost impossible to mess up. Local squash is plentiful and readily available so get creative and add some squash to your life! I had my soup on it's own, and a tiny bowl really did the trick. My hubby mixed his with an organic sprouted rice & quinoa mix from TruRoots. This is so thick, it would be amazing on pasta as well. 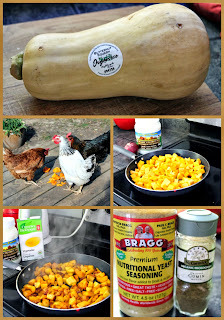 The chickens loved the seeds I scooped out of the squash! Peel and cube butternut squash, and brown in 2tbsp coconut oil. You will need the pan to be quite hot. Once there is a beautiful caramel colour on a few sides of each cube add 1-2 cups vegetable stock, lower the heat to low/medium and put a lid on pan to steam squash. While squash is cooking sweat your onions in a tsp coconut oil. When the squash is cooked (soft) remove it from the heat, and place cooked onions on it. Use the onion pan to caramelize your garlic adding a tsp more coconut oil if needed. Just squish each clove a little before putting in hot pan to brown each side. Put a lid on and turn heat off after brown to soften the garlic up a bit. Once the garlic is done put it on the squash and onions and leave pan to cool completely. Once everything is cool, put everything in a blender with enough vegetable stock to get it moving. I put the blender on and did the dishes to let it really blend like crazy. If you blend the squash hot, you will blow the lid off your blender and have squash on your ceiling. Just wait until it's cooled. When I was transferring the mixture to a soup pot I thought to myself... oh crap, I just made baby food. Have no fear, you will have delicious soup - not baby food. That being said, if you hate cooking - just start with a dozen jars of baby food and mix in some onions and garlic. 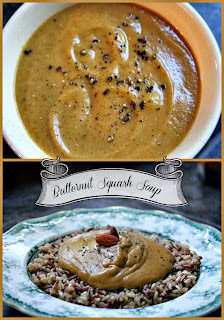 Turn the pot of squash mixture to low and when it's warmed up add 1/2 cup of nut butter. I used almond, but I'm sure any nut butter would do. This is when you can decide how thick you'd like the soup to be. I like soup that the spoon can stand up in, so I only added a cup of veggie stock. When it's at your desired consistency - have a taste. You might like it as is. I added, a pinch of salt and pepper. Tasted it. Added 2tbsp nutritional yeast. Tasted it. Added a teaspoon of cumin. Tasted it. Added 2 tsp of freshly squeezed lemon juice. Tasted it. Perfecto! You could add all sorts of fresh herbs and spices depending on what you have on hand and what you plan to serve it with. If you're going to use it to top pasta, consider pan browning fresh rosemary and mixing it in. I knew I wanted soup and my hubby wanted squash so I spent a few minutes putting this together and now we both have a lovely, healthy soup in the fridge for the next few lunches and dinners. I didn't have a recipe, I just went with what I had on hand and ended up with something delightful! Get creative with cooking, trust your tastebuds and make something fresh and tasty for dinner tonight.